2 questions about doing hexigons..... When you whipstitch the hexis together, how far apart should your stitches be? Once you have a group of hexis sewn together, what do you do next? I don't know how to finish them. Thank you! I've done the 3/4" about 20 stitches on each side. that's just me. I sewed mine tog with a green path. used all different greens. then I appliqued it to a black border, about 6 inches or so. I used black coz my kitty got it as a Christmas present. it didn't match anything I had, and she looked great on it. it's about 50" x 65"
I was sent some from a European quilter. Those stitches were so small I could almost not see them!! I don't use a whip stitch because those stitches are visible. I use a ladder stitch instead. I am doing Grandmothers Flower Garden using 1930s reprofabrics/white. I use a buttonhole stitch! It makes a tiny hinge and the hexes lay nice and flat! I am working on a hexie GMG - I also use the lader stitch - 1/8 inch per stitch - you really can't see the ladder stitch - it is very forgiving. About 15 stitches per inch!!!! I will try and post pics! Just got a new mini IPad so still learning how things work!!!! This thread is extremely helpful to me! I've just begun my attempts at EPP. It's gone... okay. xD Still a LOT to learn! I've never done handwork before. Got there! Work in progress! FAB work as usual H !!!! It's quarter to me time!! It's growing S L O W L Y!!!! When you wh stitch do it as close as possible and make sure you only pick up a tiny thread. Donot go into the paper in the hexagon. Match you thread where you can with the colour you are using or use an invisible or silk thread. Silk is best. 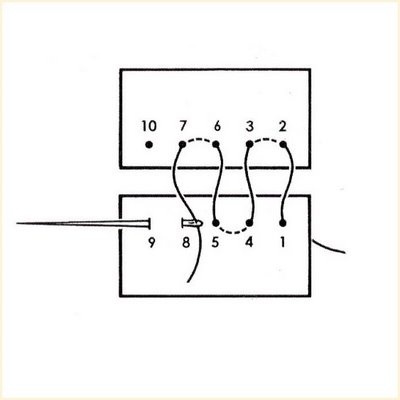 Some people when the quilt use a fancy maching stitch which joins the hexes. Or you can hand embroider over if threads show. A handy tip passed on to me.... When doing scrappy GFG keep all centres the same colour(I used red) but blue/green/yellow etc could be used....it helps even out the effect! Thanks...glad to be of help!!!! First time I've posted pics from my Ipad...so a learning curve for me too!!!! Happy hexing!!! Thank you for the help & the pics!! Your quilt is beautiful! I can't imagine how long it would take me to do something like that......but I may have to find out. So far, no one has answered part 2 of my question........ how do you finish it off once the hexis are sewn together? So, in your case, how will you go about putting backing onto your quilt-top? Oh.....and how big are your hexis? Thank you Tilladare for posting this link. I had seen it before, but for the life of me, couldn't find it again. Will be sure to bookmark it! 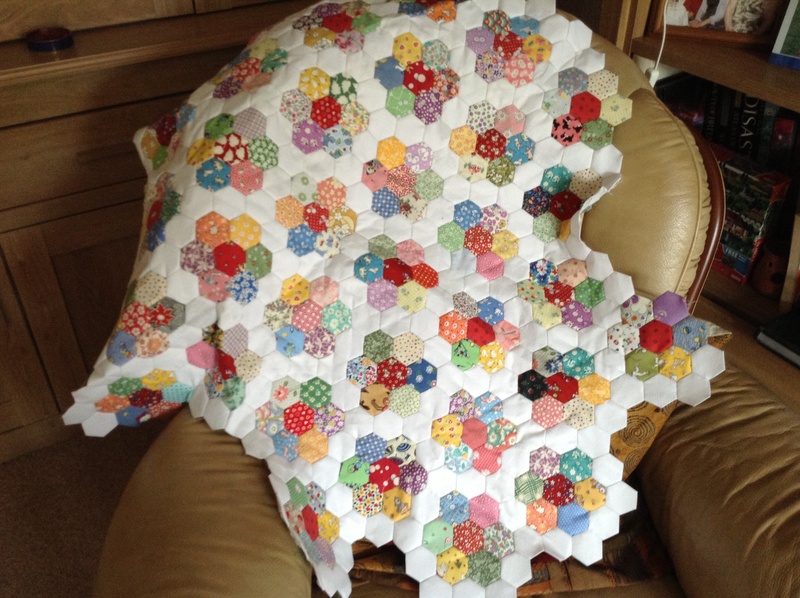 I am near finishing up a hexagon quilt top, and think this may be a good way to go. I usually applique the top to a stright edge, because I don't want to lose the hexie shape, but this looks very interesting. thanks again! humbird, please be sure and post a pic when you get your top finished! I started using the whipstitch and then found the ladder stitch--what a difference. A much neater looking seam. 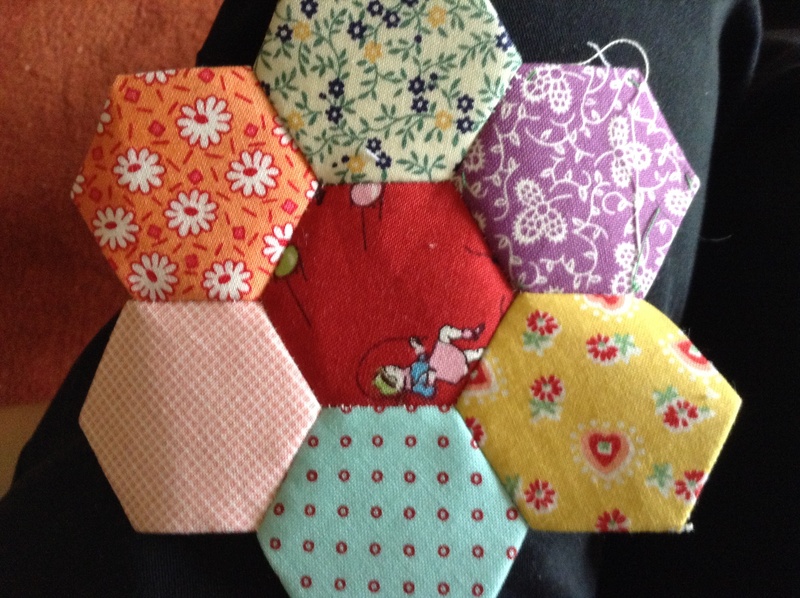 As I'm doing 3/4" hexi's I think they may be an1/8th of an inch apart. 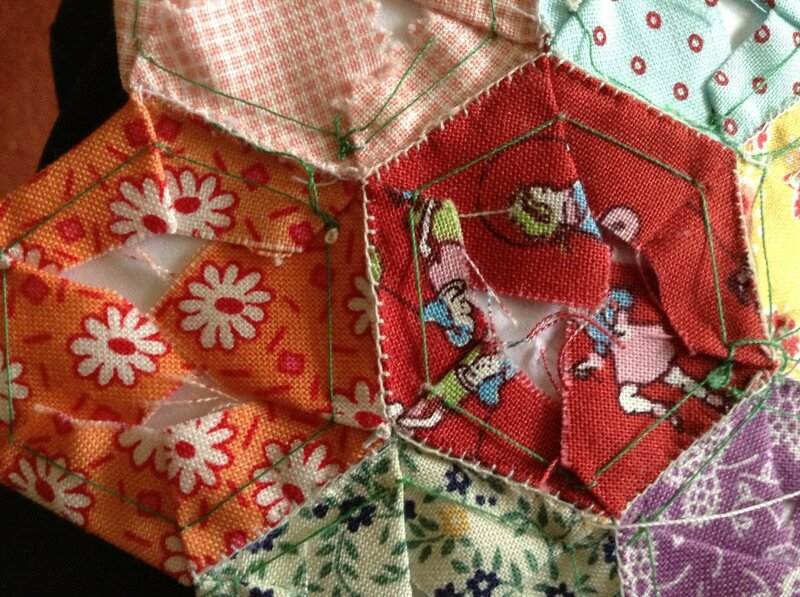 I like badskirts method, but that takes alot of extra hexi's. I have appliqued the top to border pieces. Last edited by oksewglad; 06-13-2013 at 05:35 PM. That's the way I do mine and my friends just gasp when they turn it over and see my stitches! Literally mine are a needle's width apart and I use an 11 Straw needle. But seriously, everyone finds their own rythm and what they can live with.